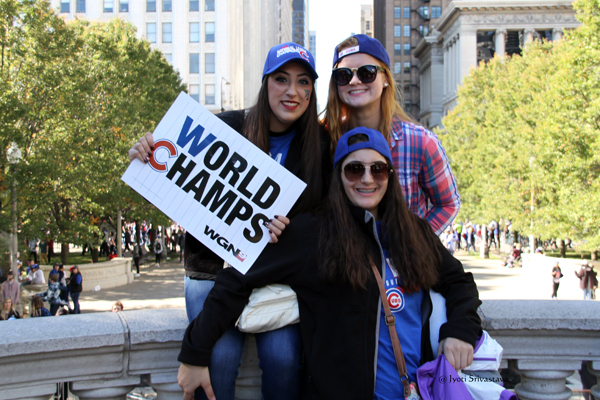 Chicago Cubs win World Series championship. The Cubs won after defeating the Cleveland Indians 8-7 in Game 7.
and won for the first time since 1908. 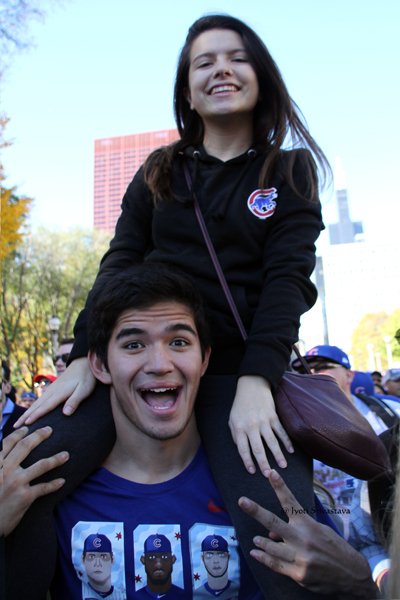 This is Chicago Cubs’ first World Series championship in 108 years! I am not much of a sports fan. However, a win after 108 years is most truly historic. And I absolutely enjoyed the way the city celebrated the victory! 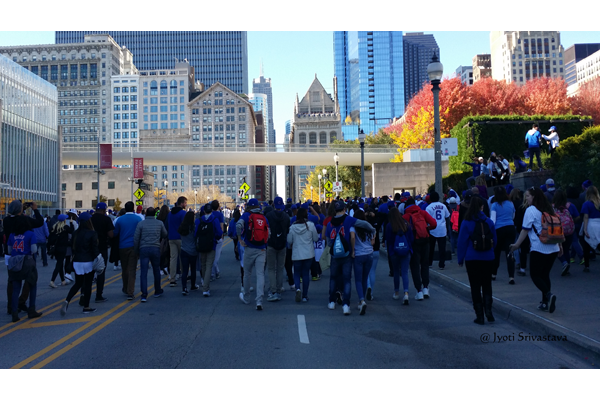 Approximately 5 million people turned out to celebrate the Chicago Cubs World Series victory, although the city’s population is only about 2.7 million. People from all over the Midwest packed trains and roads in advance of the Friday rally. The celebrations ranks as the 7th largest gathering in human history. Now that’s something!!! It was also interesting to note how the city institutions rose to the challenge of managing such a massive influx of crowd, and how the city’s department of transport and communication, city police, and city fire department geared up for the event. 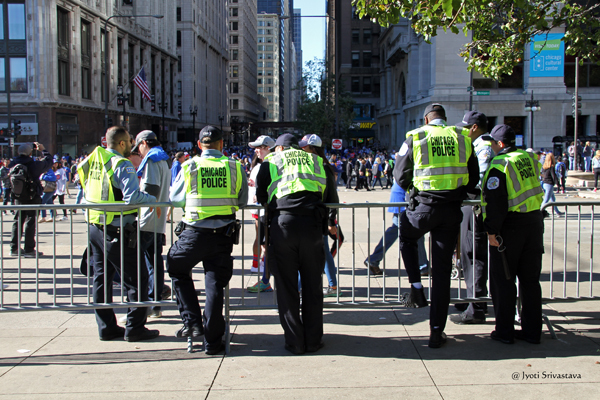 The Emergency Management team had mock up drill at Wrigley Fields. There was also the challenge of a massive clean-up operation after the celebrations. Sports victory celebrations are like ultimate “Civic Pride” moments. When there are huge gathering at a music festival, it’s that people enjoy the music; when there is a massive political gathering, its usually because people have some issue at stake; but when crowd gather to celebrate victory at a sports championship, it is display of the purest form of civic pride – a team participates, a team wins and the whole city feels like champions!!! The idea was to see the victory parade. But the above video is evidence that I could barely manage to see the parade. I was standing behind at least 10 walls-of-people in front of me, and could barely move a foot from where i was standing! 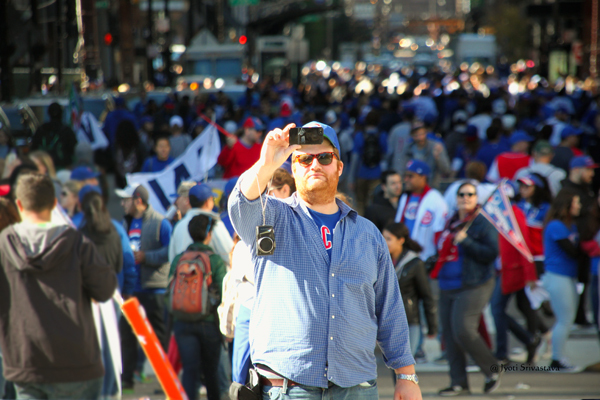 But it a fun experience to be in the midst of a sea of Cubs-fan! If you strain a bit, you can probably see some parade buses. 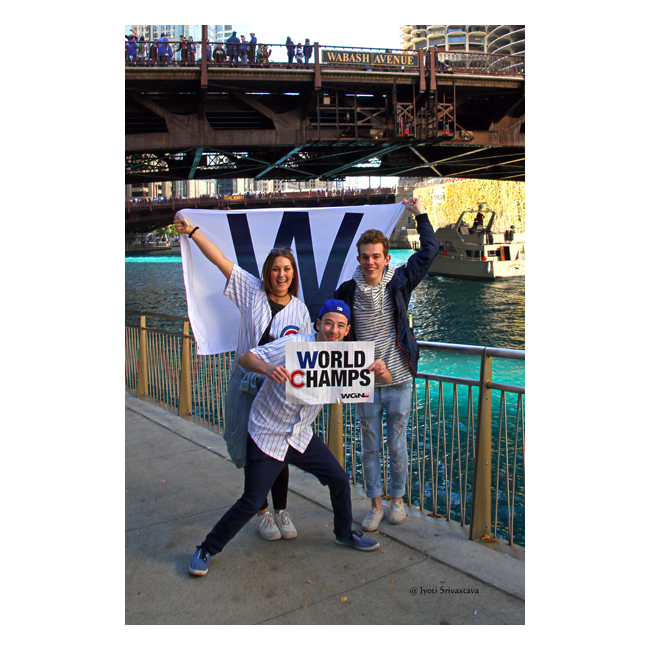 Fashion Accessory of the Day: Cubs gear – World Series Championship T shirts, hoodies, jackets, caps and scarves. 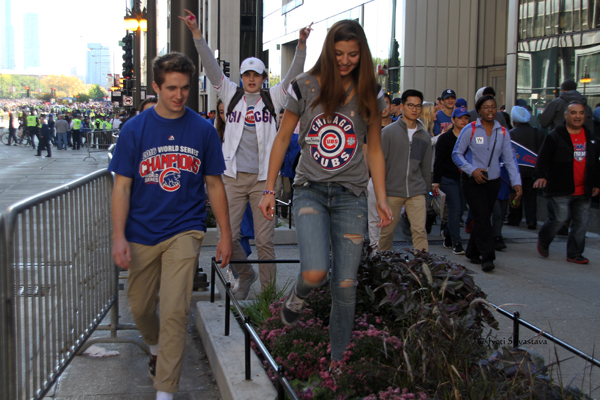 The Cubs have used the phrase “Fly the W!” and an accompanying social media hashtag “#FlyTheW” has been heavily promoted by the team and its fan. 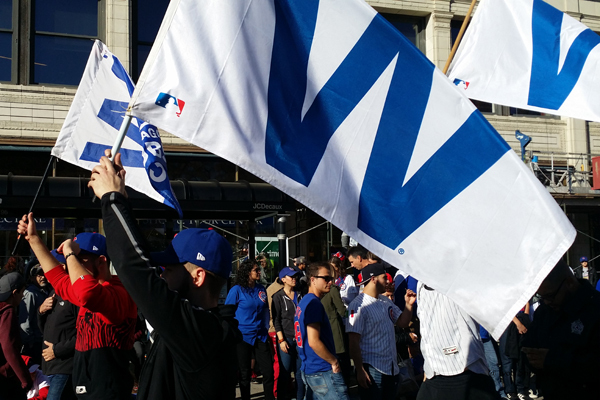 It refers to the victory flag or Cubs Win Flag, which is composed of a large blue letter “W” on a white background. The Loss Flag is a large white letter “L” on a blue background. The Cubs Win Flag is flown at Wrigley Field after every Chicago Cubs home win. The tradition of flying a win or loss flag over the stadium began soon after the construction of the scoreboard in 1937. 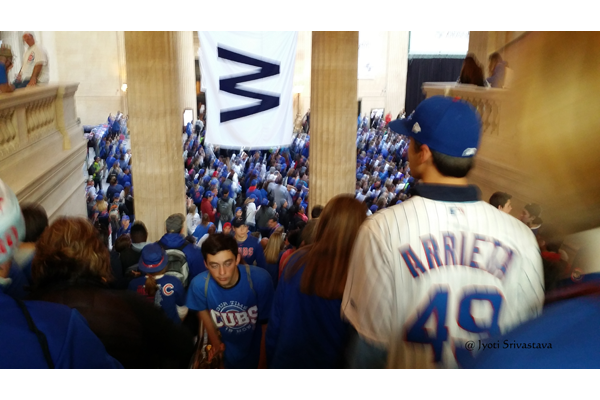 The flag is variously referred to by approximately a dozen names, combining; either Cubs or Chicago Cubs; Win, W, White, White W, or W Win; and flag, banner or banner flag. 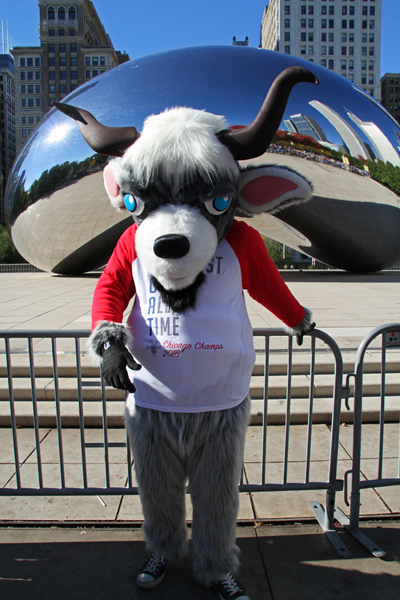 The Curse of the Billy Goat was a sports-related curse supposedly placed on the Chicago Cubs Major League Baseball franchise in 1945 by Billy Goat Tavern owner William Sianis that lasted in a 71-year period from 1945 to 2016. Because the odor of his pet goat, Murphy, was bothering other fans, Sianis was asked to leave Wrigley Field, the Cubs’ home ballpark, during the 1945 World Series. Outraged, Sianis allegedly declared, “Them Cubs, they ain’t gonna win no more,” which has been interpreted to mean that either the Cubs would never win another National League (NL) pennant, or that they would never again win a World Series. The Cubs lost the 1945 World Series to the Detroit Tigers, and did not win a World Series championship for the next 71 years until, until 2016. Nike spoke the minds of millions of Chicago Cubs fans hours after the team’s first World Series win in 108 years. 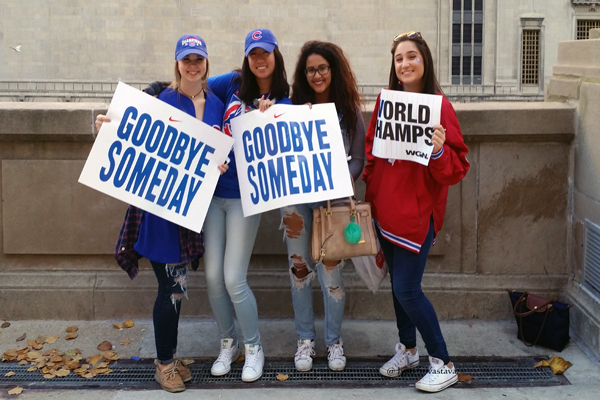 “Goodbye Someday.” The shoe company released a new commercial celebrating the Cubs win by bidding farewell to more than a century of “maybe next years.” [ Reference.. click here.. ].. 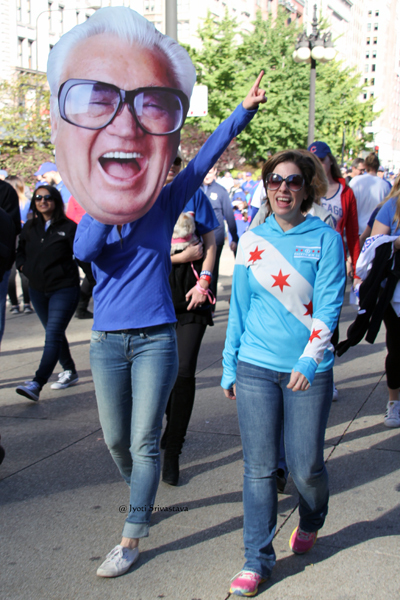 Legendary Broadcaster Harry Caray – Nobody represents the Cubs more than Harry Caray. The legendary broadcaster called Cubs games for 16 years. During the 1991 season, Caray famously said, “Sure as God made green apples, someday the Chicago Cubs will be in the World Series.” He passed away in February 1998, at the age of eighty-three. On April 10, 1998, a seven-foot-tall bronze statue of Caray was placed outside Chicago’s Wrigley Field. soon after Chicago finished up their first World Series championship in 108 years. The song “Go Cubs Go”. 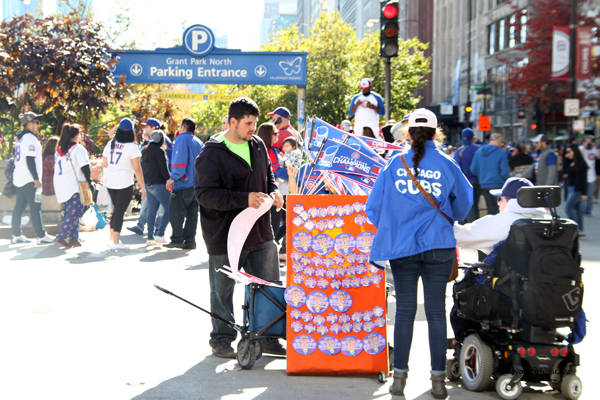 “Go Cubs Go” is a song written by Steve Goodman in 1984. At various times the Goodman version of the song has been the official Chicago Cubs team song and the official Cubs victory song. The Goodman version of the song is now referred to as the official Chicago Cubs victory song. 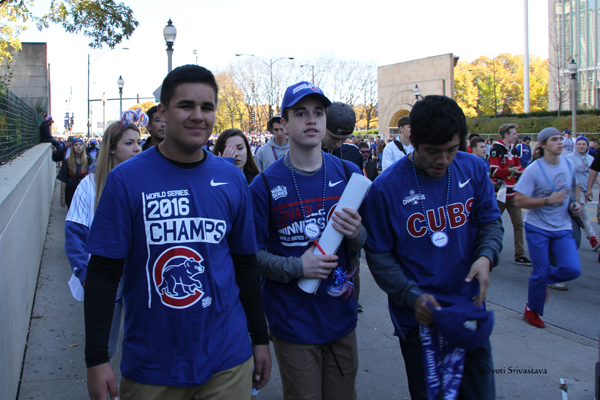 Approximately 5 million people turned out to celebrate the Chicago Cubs World Series victory. The celebrations ranks 7th largest gathering in human history! 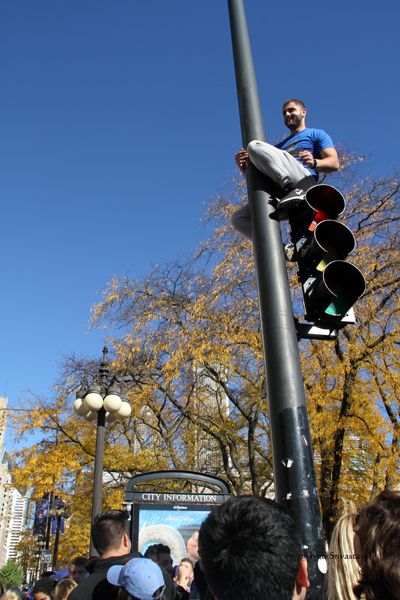 It was like the ultimate civic pride moment for the city! 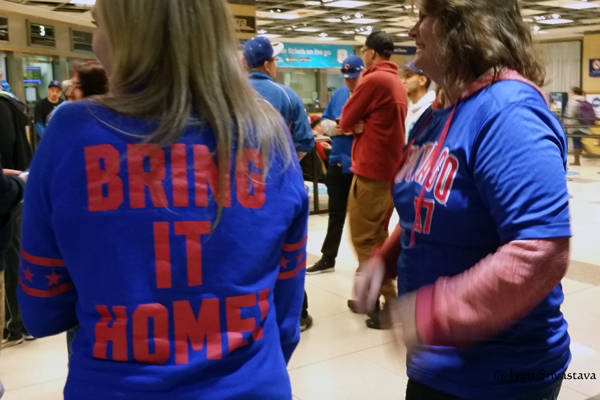 People were in Cubs gear: World Series Championship T shirts, hoodies, jackets, caps and scarevs. Accessories like flags and banners were flying everywhere. People were waving the W victory flag! 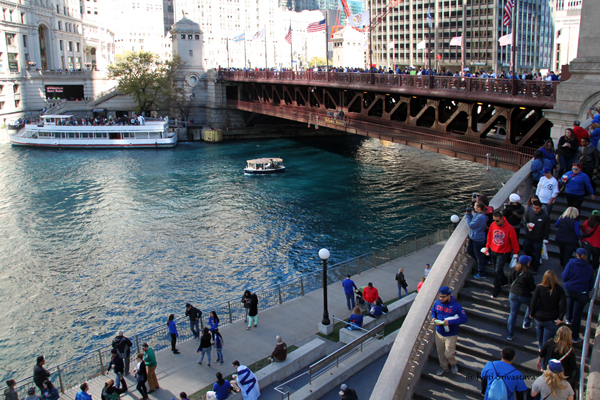 The color for the day was – Cubs Blue!!! The famous Art Institute lions are prepped-up for different occasions, like wear festive wreaths during Christmas or the dress up in team helmets or caps when a Chicago sports team qualifies for the championship in its league. 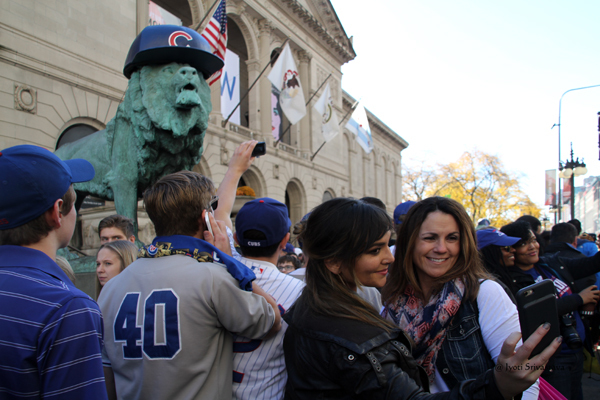 In the past, the statues have donned White Sox, Bears and the Blackhawks gear. 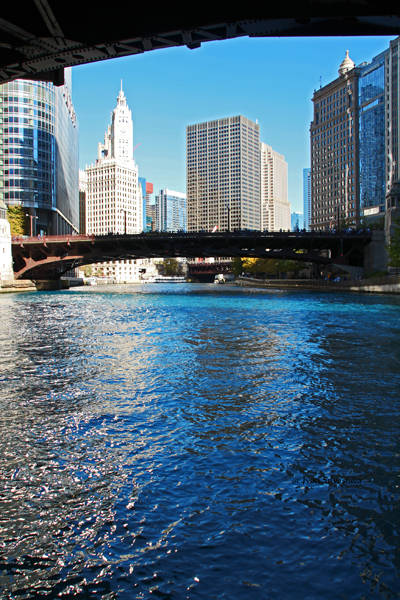 The city decided to dye Chicago River in beautiful “Cubs blue.” The dye job isn’t anything new for the city as traditionally the city dyes the river green for St. Patrick’s Day annually. 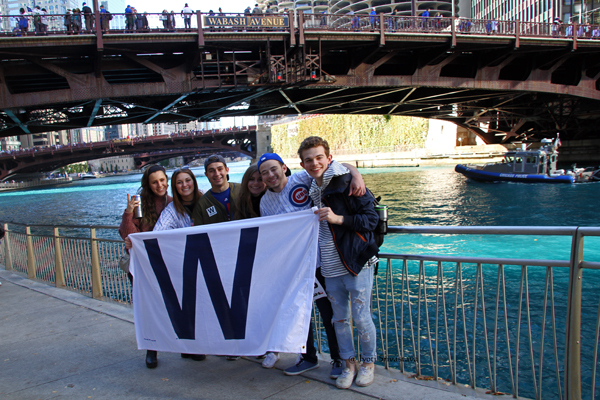 I met a group of wonderful millennials celebrating Cubs victory by the Chicago Riverwalk. I requested them to pose with the victory banner. They did. I Thank them profusely. I took their email to send them the photo, but somehow have misplaced the papaer. I am so sorry! If anyone know any of these kid, could you please send them the link, so I can send them the image. 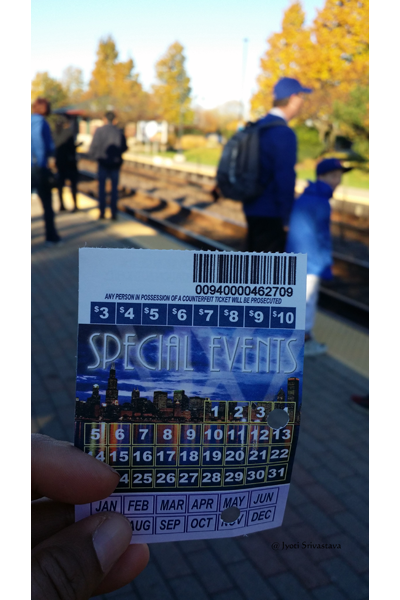 Metra Special Events ticket – $ 5 round trip for the day. But, when 5 million people attend an event, there has to be some interruptions in smooth flow of events. Though the city’s population is only about 2.7 million people, people from all over the Midwest packed trains and roads in advance of the Friday rally. Metra trains were packed to capacity and began passing some stations altogether. Inbound train: My train from Schaumburg was full and did not stop after Roselle, skipping all the other stations. Outbound Train was difficult to board as Chicago Union Station came to a standstill.